Want to create an invitation email that matches your company branding? Customize our optimized email invitation template to make it your own. When you invite people to leave reviews, you want to send a great invitation that your customers will respond to. If you're on a Pro or Enterprise plan, edit our existing invitation templates to create custom review invitations. Just create a copy of an existing Trustpilot template, then customize it to your heart's content. If you don't have a Pro or Enterprise plan, don't worry. You'll still send messages using our optimized templates. Trustpilot maintains and optimises these thoroughly-tested templates to maximize email conversion rates. To create a customized review invitation, the first thing you need to do is make a copy of an existing template. Log in to your Trustpilot Business account, select Get Reviews, then select the Template Editor tab. Click the Select template button. Under Optimized templates by Trustpilot, select a language from the drop-down menu. Choose a template from the list, then click the Select this template button. For service review invitations, you must use a service review template. For product review invitations, you must use a product review template. Click the Edit template button. In the Save template as dialog, rename the template in the text field, then click the Save button. Now that you've saved a copy of the template, start to make it your own and customize it. Edit the text within the text editor, and use the toolbar to format your text. It's a familiar, simple-to-use editing environment that makes it easy to change the text to suit your needs. Want to add your company's logo to the template? Follow this video tutorial. A placeholder is a piece of text that the Trustpilot invitation system replaces with a corresponding piece of data, such as a customer's name or your website's domain name. Here are the placeholders you can use in your invitation emails, and what information replaces the placeholder when the message is sent. Be sure to use the placeholders exactly as they're shown here; if you make any changes to them, they won't work correctly. Tip: The [Stars] placeholder inserts a specific call to action into the email invitation. Our user testing has shown that this is an extremely effective way to encourage people to leave a review. When a reviewer clicks a star, the review form opens and is pre-populated with the selected star level, and the reviewer can fill out the review form immediately. Can I test my invitation template before I use it? Absolutely. After you've made changes to your template and saved them, you can test your message. Click the Send test email to (your email address) button to test your message. You'll receive a test invitation from the email address that you selected as your Sender Email when you set up your invitations. You can test all the links that the email contains, including the review link. 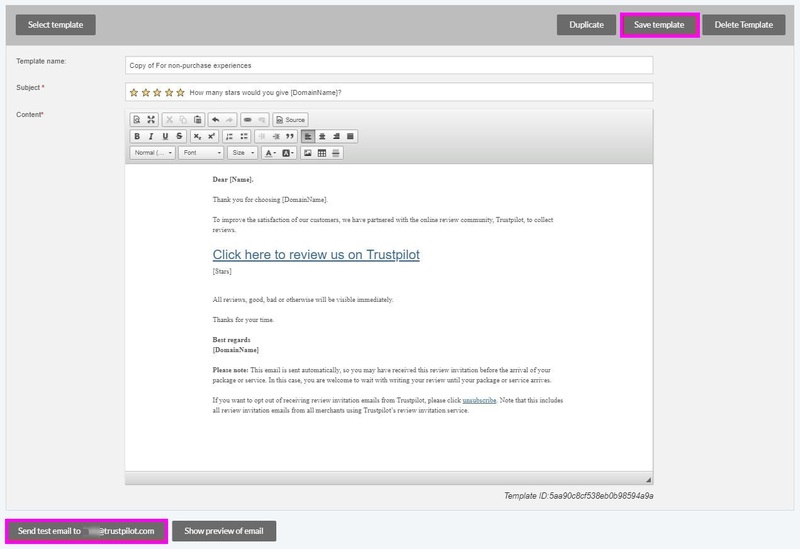 If you're happy with the message's look and contents, in Trustpilot Business, click the Save template button. How will the email look to my customers? If you want to see how your invitation message will appear to your customers, preview your invitation email. In the Template Editor, click the Show preview of email button at the bottom of the page. Can I edit my customized template after I've saved it? Absolutely. You can always find and edit your customized template. Log in to your Business account, click the Template Editor tab, and click the Select template button. Choose your custom template, then make your changes and save it. Note: Any changes you make to a template will affect invitations that haven't been sent yet, including those that have the Queued for delivery status in the Invitation History.